KH Industries, U.S. manufacturer of industrial grade portable power and lighting products has recently added RTX Static Discharge Grounding Reels. RTX Grounding Reels are for utility maintenance and service applications including utility service trucks, maintenance shops, and fuel tank static grounding. HAMBURG, N.Y. - Jan. 7, 2015 - PRLog -- KH Industries, U.S. manufacturer of industrial grade portable power and lighting products has recently added RTX Static Discharge Grounding Reels. Grounding Reels electrically connect equipment to the ground, which prevents equipment from becoming sufficiently charged to cause a static spark which could ignite flammable vapors. RTX Grounding Reels are for utility maintenance and service applications including utility service trucks, maintenance shops, and fuel tank static grounding. 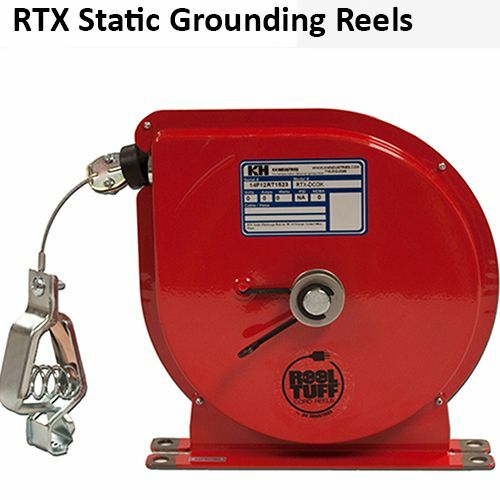 RTX Grounding Reels are built to NEC standards and feature all steel construction, corrosion resistant red powder coating, stranded steel cable, 100A grounding clamp, rubber ball stop, and a constant spring tension to keep the cable from becoming tangled. Several models are available in different cable lengths and types.